So, friends, every day do something that won’t compute. Love the Lord. Love the world. Work for nothing. Take all that you have and be poor. Love someone who does not deserve it. I've been meaning to read more of Wendell Berry and summer seems like a good time to "get around to it." The vibrant green leaves and the smell of blooming peonies seem a fitting backdrop to his poetry. I map my runs to intentionally include the rowdy peony bushes on S. 3rd Street. I always "stretch" long enough to fill my lungs with peony air before putting my race face on again. 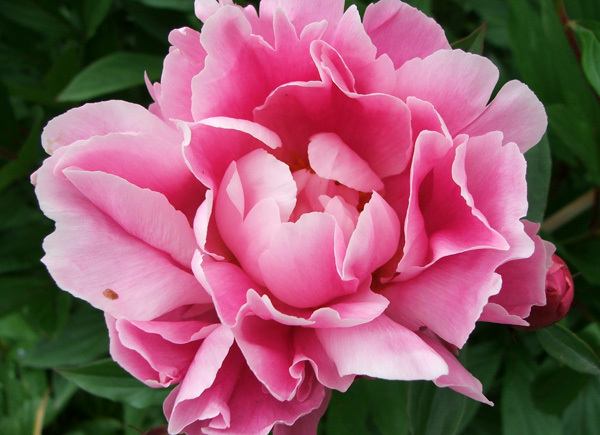 The smell of peony makes me sad for people who don't lean over to breathe in their beauty. And that's why Wendell Berry's advice to, "practice resurrection" is nestling nicely somewhere deep in my soul. We are so forgetful. We live like we don't know we're resurrected. We live like we're not sure how this day will end. We live like Christ's resurrection was too long ago to rearrange my daily toil. We live like all the wonder in the wind moving through the trees is something not everyone has the time to admire. We live like we've forgotten how to practice resurrection. We were dead in our trespasses and sins. Dead. Gone. Lost. Limp. Lifeless. Stuck. Trapped. Suffocated. Dead. There's no way to make that sound nice or easy. But if that were the end, I would have a hard time getting you to stop and smell the peonies. But God, being rich in mercy, because of the great love with which he loved us, even when we were dead in our trespasses, made us alive together with Christ—by grace you have been saved—and raised us up with him and seated us with him in the heavenly places in Christ Jesus, so that in the coming ages he might show the immeasurable riches of his grace in kindness toward us in Christ Jesus. For by grace you have been saved through faith. And this is not your own doing; it is the gift of God, not a result of works, so that no one may boast. For we are his workmanship, created in Christ Jesus for good works, which God prepared beforehand, that we should walk in them. What a beautiful interjection! What an altogether unexpected and undeserved display of mercy! What glorious gratitude is birthed when life displaces death! This is our resurrection. We are made alive together with Christ. We are raised up from the grave to sit with Him, to search out the immeasurable riches of His grace, to seek all the beauty of His face reflected in the glory of creation. This is our resurrection. Practice resurrection today, friends. Practice resurrection and do not forget. Practice resurrection because, in Christ, life has displaced death.